Encinitas Ranch is beautifully located close to beaches, fabulous shopping and restaurants, parks, great schools, transportation, the Encinitas Ranch Golf Course and the famed San Diego Botanic Gardens. Homes here are generally fabulous, with many offering ocean and/or golf course views. Many owners have taken great effort and undergone enormous expense to upgrade their homes to the hilt. Their loss just may be your gain! A truly stunning Encinitas Ranch home,in the heart of Encinitas, with an amazing backyard and beautiful canyon views! Having 4 bedrooms, 3.5 baths, 2 offices, and a huge bonus room, you will have no shortage of space! The first floor living is inviting with high ceiling rooms, wainscoting, crown molding, & warm rich wood floors. A large gourmet kitchen with a center island opens to an impressive family room, and looks out to the beautiful Pool, Spa, and cozy firepit. Close to shopping, I-5, beach, & more. Encinitas Executive Living at its Finest. Highly upgraded with wains-coating in entry, formal dining, living room and stair wells plus custom crown molding throughout. Beautiful finishes include travertine & wood floors, custom iron stair rails, granite counters in kitchen and all baths. One bedroom with full bath downstairs. Dual staircases. Enjoy social gatherings in the combination family room/kitchen great room. Features include cozy fireplace and built-in alder entertainment center. New carpet. Subject is one of 8 semi-custom homes designed by world renowned Robert Hidey Architects in the exclusive community of Sidonia at Encinitas Ranch. Only 3.5 mi from Moonlight Beach, features include 4 en suite bdrms in the main house , 3 fps, Casita w/bath & balcony, motor court w/4 car garage, extensive yard amenities including saltwater pool and spa, covered loggias, fps, fountains, firepit & meandering cement & flagstone walkways. Subject backs to the 15th green of the Encinitas Ranch Golf Course. Prepare to be in awe as you enter this spectacular bright and open home! Gaze upon the circular staircase with decorative wrought iron detailing, a large separate living and family rooms, dramatic floor to ceiling windows bathe the living spaces in natural light. The Chef’s dream kitchen features a plethora of cabinet and counter space, a large eat-at center island, double oven and a massive built-in refrigerator, plus a butler's pantry with wine cooler adds convenience to all your gatherings. 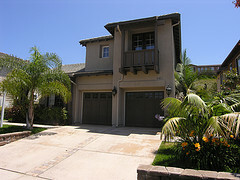 Turn key picture perfect Encinitas Ranch home boasting amazing golf course, ocean & sunset views. This 5BR, 5BA home offers countless upgrades- custom entertainment center w/surround sound, chef's kitchen with high end S.S. appliances, upgraded light fixtures, window coverings/shutters. Entertainers yard includes a built-in barbecue w/fridge, Jacuzzi with wrap around decking, grass side yard for pets, 3 car garage, alarm system, video doorbell and nest thermostats . It's a perfect 10! STUNNING FIVE BEDROOM HOME IN ENCINITAS RANCH! Ideally located within Encinitas Ranch is this highly upgraded home featuring everything you have been looking for! The home offers tons of natural light, soaring ceilings in the entry, a formal living and dining room, a spacious kitchen, a full bedroom with en-suite bathroom on the main level, a spacious and private backyard, and much more! **PRICE REDUCTION**Fabulous Encinitas Ranch VIEW HOME situated on a quiet cul-de-sac in the Devonshire community. Boasting one of the largest lots of the development, this home features newer wood flooring, impressive story windows with incredible golf course views, plantation shutters, and custom built-ins in the living room, family room, and master. Enjoy your private deck off the master suite and take in the views of the golf course, pond, & ocean. Watch the sun rise and the sun set from your new home! Welcome to the highly coveted community of Encinitas Ranch. Located minutes to the beach, world-class golf, shopping, restaurants and so much more! This stunning retreat is a beautiful showcase home! Complete w/private downstairs en-suite, detached multi-functional space located off entry/courtyard. Gorgeous details throughout including a sprawling spa-like retreat with extended seating area. Add'tl bonus rooms serve as the perfect office retreat, playroom, media/game room or hobby room.